With all the crazy unexpected things that are happening in the world lately, the upcoming supermoon set to happen on November 14th will finally give us something that we can all look forward to seeing. The full moon that rises in the night sky next Monday will be a truly spectacular sight to behold, one that is actually worthy of our attention and appreciation. That’s because the moon will shine brighter and appear larger than it has in the last 68 years! While all full supermoons appear super-sized and much larger and brighter than usual size, this November one is extra special because it’s happening when the moon is the closest to the Earth that it has been in the last seven decades. 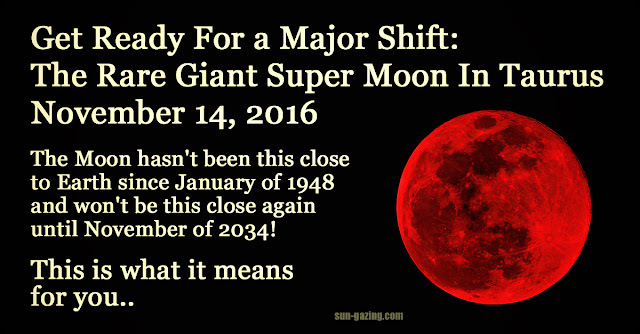 As such, it will likely be the biggest moon you’ve ever seen. There are many other implications which are linked to this special lunar event beyond the scientific meanings, and perhaps the biggest one is the cosmic shift in energy that will accompany it. Astrologically speaking, the November supermoon will occur when the sun is in Scorpio and the moon is opposite that, in Taurus. This brings to the forefront a sort of tug of war between the powerful, determined, and intense Scorpio energy and the responsible, stability craving Taurus. The resulting clash will create a burst of energy which you can either embrace and grow with, or oppose and struggle against. It’s an opportunity to re-evaluate your goals and how to best achieve them. Whatever it is that you may be striving towards will need to be tweaked and minor adjustments should be made in order to keep them within sight and reach. The practical and responsible side of Taurus will aid you in making the best possible choices so don’t put off your goal re-assessment because now is the time for it! It’s a time to stay grounded- Don’t let a sense of self-importance or entitlement get the best of you and drag you down. Instead, stay conscious and present, be aware of your ego and don’t get caught up in it. If you stay grounded and stable then everything will go a lot smoother. There will be a noticeable change in many of us in the days leading up to November 14th and you’re likely going to feel much more emotional than usual. All full moons tend to bring out the crazy side of people, hence the term lunacy, but the extreme proximity of this supermoon will end up supercharging our feeling and emotions. By being aware of this you’ll be better prepared to stay grounded, as mentioned above, and the moon won’t end up wreaking havoc on your emotional sanity! This is the perfect time to strengthen and heal any rifts with friends or family. The parent/child bond is especially highlighted here and the focus should be on respecting and honoring our close family relationships. If we are to grow and succeed in life, both mentally, spiritually, and emotionally, then we need our loved ones supporting us and on our side. It’s the perfect time to nest. With the moon being in Taurus, the sign’s stability and security loving traits will be highlighted and you’ll want to do nothing more than stay at home and relax. Want to read that book you’ve been waiting to get to or catch up on your favorite show? Grab a warm cozy blanket, sit back, and unwind! Break free of all the toxic people in your life. Any relationships that are hurting you, dragging you down, or holding you back need to be fully re-assessed. You need to distance yourself or cut the cord completely if you find that someone is not worth the time, effort, or stress that they bring to the table. Don’t allow someone to take advantage of your kindness, put an end to it and move on. 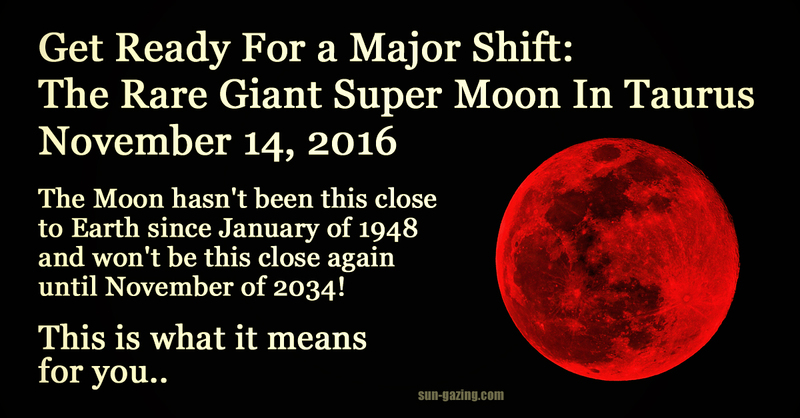 Overall, the shift in energy accompanying this November supermoon will be mainly positive. If you don’t fight it and go with the flow, then you can better connect with the energy it brings. In the end this can only lead to some really great things happening in your life, so welcome it with open arms!